After being kidnapped from his school bus and held in an underground bunker for nearly a week, a 5-year-old Alabama boy identified only as Ethan was released from the hospital on Tuesday and finally went home to his family. While authorities were tight-lipped during their tense standoff with his captor, 65-year-old Jimmy Lee Dykes, they’re beginning to share details on how they pulled off the incredible rescue. After sneaking a surveillance camera into the underground room and building a mock bunker to practice their plan, on Monday the FBI determined Dykes was becoming more unstable and decided to move in. According to CBS News, the FBI’s Hostage Rescue Team exploited a routine they’d developed with Dykes. When he asked for supplies, they would leave them at the bunker’s entrance. When he climbed the eight-foot ladder to open the hatch on Monday, agents dropped two stun-grenades that set off noise and light to disorient Dykes. Officials say Dykes still managed to fire a shot, but he missed and agents returned fire, killing him. Ethan, who turns 6 on Wednesday, was physically unharmed. His mother said in a statement, “I woke up this morning to the most beautiful sight: my sweet little boy. I can’t describe how incredible it is to hold him again.” The town is planning to hold a party to celebrate his birthday and the life of hero bus driver Charles Albert Poland, Jr., who was fatally shot by Dykes. 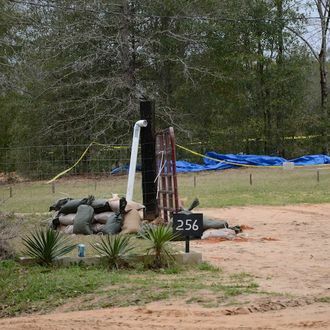 Explosive devices were found in the bunker and in the ventilation pipe Dykes used to talk with authorities. During their negotiations, Dykes, who was a survivalist and anti-federal government activist, repeatedly asked to speak with a TV reporter. Officials wouldn’t explain how they managed to get a camera into the tiny bunker, telling NBC News, “It’s a technique we may want to use again, so we’re not being specific.” So rest assured that if there’s another horrific kidnapping that ends with a hostage trapped underground for days, the FBI will be ready.